Numbering less than 1000 people, the Dayak Benuaq from the Eastern Kalimantan region of Indonesian Borneo still practice many of their traditional ceremonial customs. 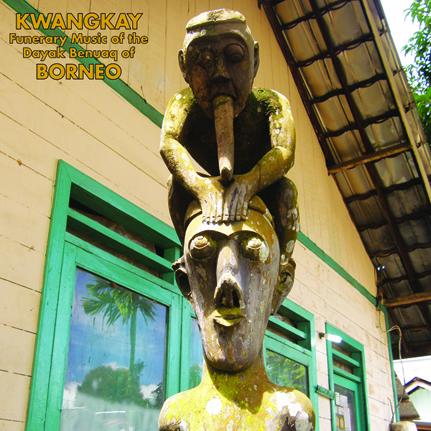 This album of field recordings presents the music associated with the kwangkay, the secondary mortuary ritual celebrated by the Dayak Benuaq, recorded live on location by Vincenzo Della Ratta. According to the Benuaq belief system, upon death the soul of the human being is transformed into the liau, associated with the physical body, and the kelelungan, associated with the intellect or the head. Both the liau and the kelelungan temporarily reside in a sort of cosmic location, connected respectively with the bones and the skull of the deceased, who has entered a state of deep unconsciousness, as yet neither pertaining completely to the realm of the living, nor to that of the dead. Music plays a key role within the kwangkay, as it is crucial for guiding the liau and kelelungan spirits to their final destinations. It is also intended to please the spirits of the dead by providing them with entertainment. This ritual includes a night dance performed for the spirits and accompanied by a musical piece known as the ngerangkau. These rites and ceremonies are often dedicated to several deceased persons and are held within a house belonging to one of their family members. Featured here are two different versions of the ngerangkau, with their long, trance-inducing rhythmic gong patterns. There are two more tracks on the album which are not specifically related to the kwangkay. Titi mati is a gong piece commonly played to proclaim the recent death of a villager. And finally, the nocturnal soundscape of a village by the river Mahakam, a channel of transport and communication which is essential for the local people of the Benuaq territories. Limited edition vinyl LP with insert of text and images by Vincenzo Della Ratta.